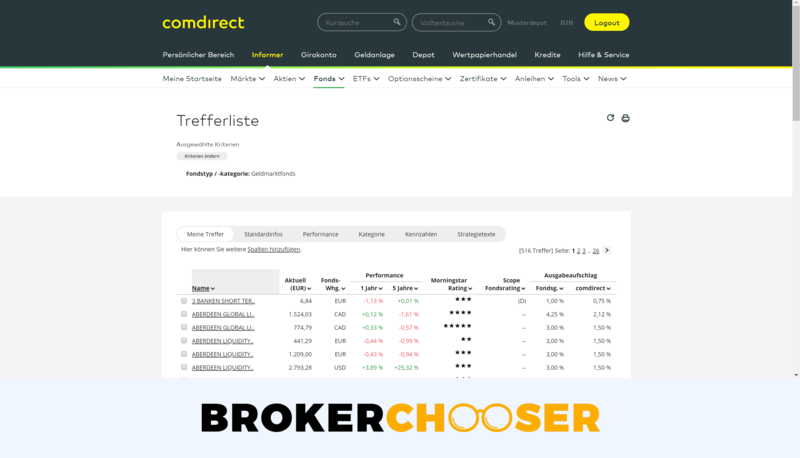 Comdirect is a German online broker established in 1994. It is regulated by BaFin, the German financial authority. It is listed on the Xetra and London Stock Exchange. Its bank parent is Commerzbank. Condirect is considered safe beacuse it is listed, regulated by a top-tier regulator and has a bank parent. Comdirect has great research tools and provides innovative services like social trading. Its trading platform customizability is one of the best, so is great for frequent traders as well. It holds a banking license, is listed on stocks exchanges and has a strong parent company. All of these mean higher transparency and financial stability. Comdirect's fees are high. The account opening for non-Germans/non-Austrians is very complicated. The full service is only in German. Comdirect trading fees are high, while non-trading fees are average. We compare Comdirect fees with its peers, DEGIRO and Saxo Bank. Comdirect's trading fees are high, although the fee structure is transparent. 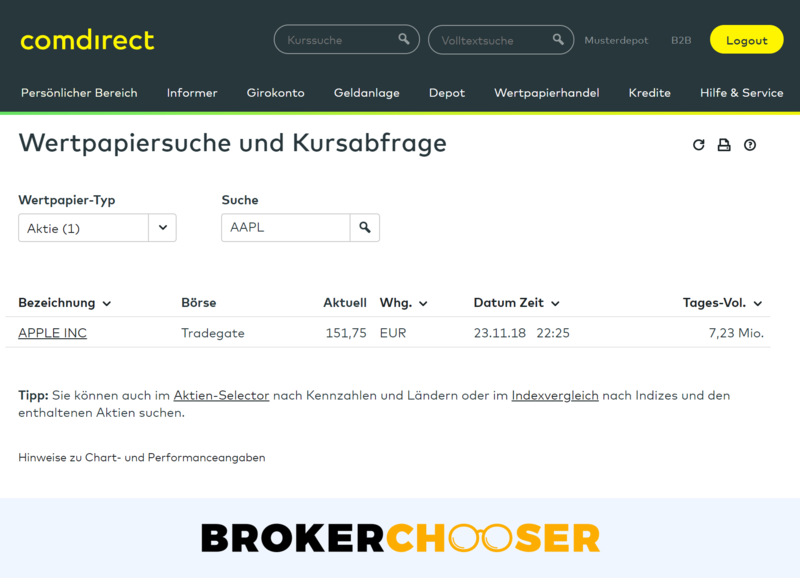 Comdirect's stock trading fees are also high if you compare with a discount brokers like DEGIRO. The stock trading fee calculation is volume based and has a minimum and a maximum amount per one trade. Comdirect's forex fees comes high as well if you compare with the best forex brokes. Comdirect does not charge any commission for forex trading. The fees are incorporated into the spread and the financing rate. Comdirect's fund fees can be low as you can always choose discount funds which you can buy free of charge. Comdirect fund buy fees vary between 0% and 5%. We calculated with a 1% average. The bond fees are average . The same calculation formula applies to bonds as to the stocks. Comdirect's stock index option fees are calculated based on the following formula: €4.5 / contract, min. €19 / one trade. The stock index futures fees are high as well. Comdirect's stock index futures are based on the same formula as the stock index options: €4.5 / contract, min. €19 / one trade. Comdirect offers lower commissions for stock CFDs compared to the real stocks. At Comdirect you can buy cryptos through ETNs (exchange-traded notes) and certificates. At the time of the review, you can trade with Bitcoin and Ether ETNs on the Stockholm Stock Exchange. If you want to understand what is a crypto ETN check out our crypto blogpost. Comdirect has high financing rates. We picked popular trading instruments, like Apple stock or EURUSD and compared them for you. Comdirect charges 4% premium over the benchmark rate of the product. For example, for Apple CFD is 4% + USD Libor rate. Comdirect has average non-trading fees. Withdrawal is free of charge, however, you have to pay a €5,85 quarterly inactivity fee if you do not trade 2 times in a quarter. 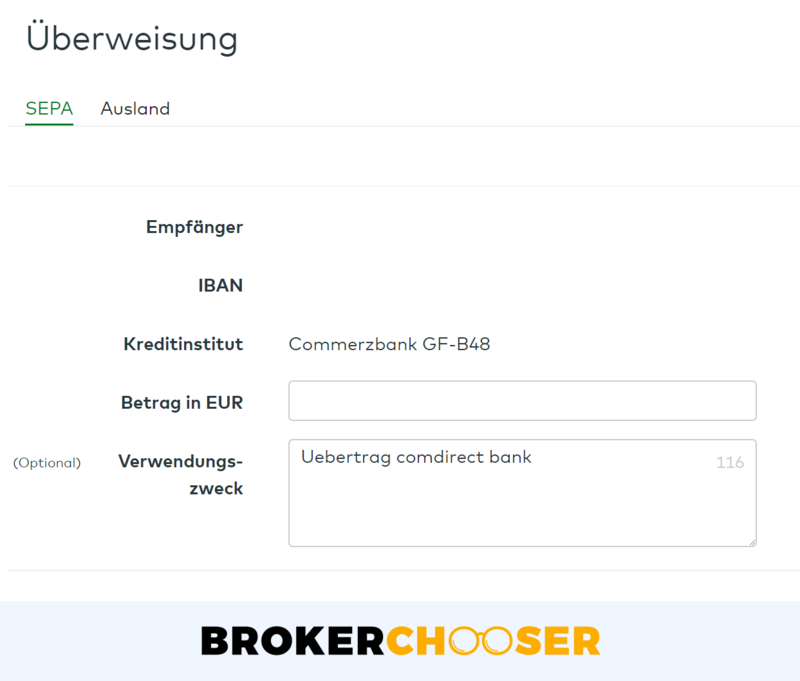 Account opening is easy and fully digital for German and Austrian clients, but complicated and long for other citizens. It is not transparent from which countries you can open an account. We believe from most European countries it is possible to open an account. However, opening an account for a non-German/non-Austrian citizen is more complicated. We do not recommend to open an account if you do not speak German since the full service, including the customer service is in German. At Comdirect there is no minimum deposit except for the Auslandsorder account. This requires a €500 minimum deposit. 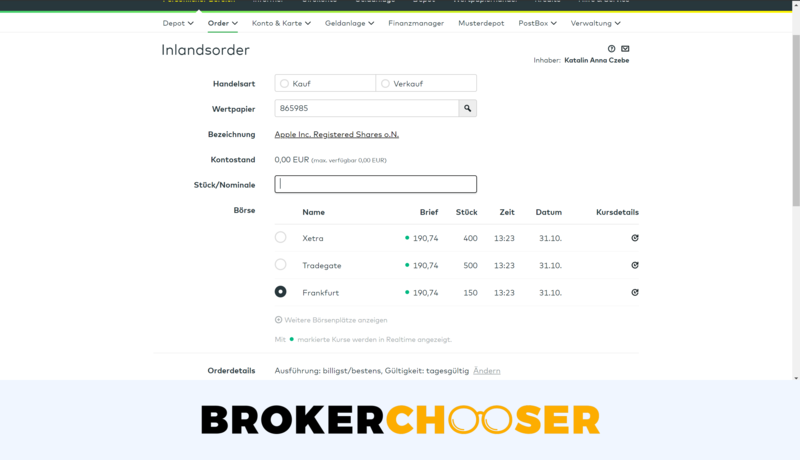 Inslandsorder account: this account gives you access to German stock exchanges. 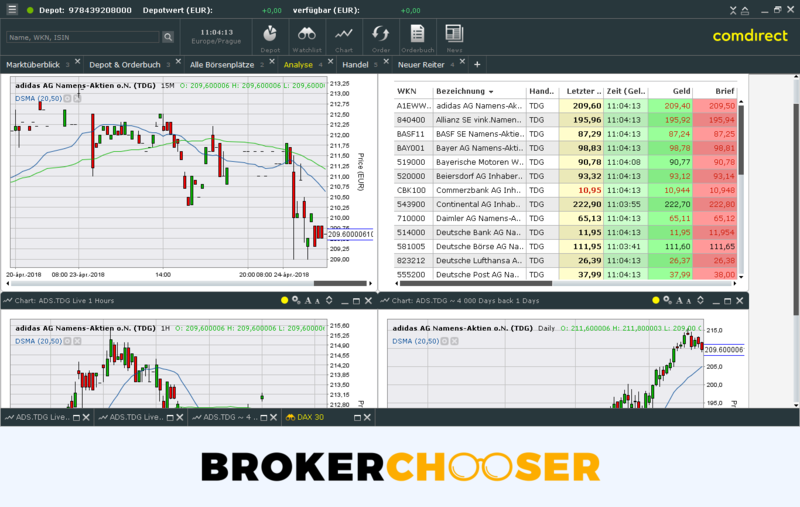 Auslandsorder account: this account gives you access to international stock exchanges. 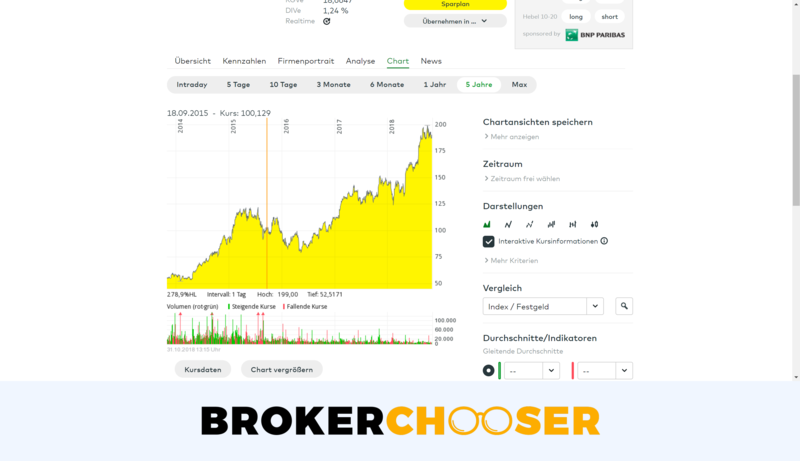 Live trading account: this account gives you access to Comdirect's own OTC market. You can trade here stocks, funds, bonds, warrants and certificates. CFD account: you can trade CFDs via these accounts. 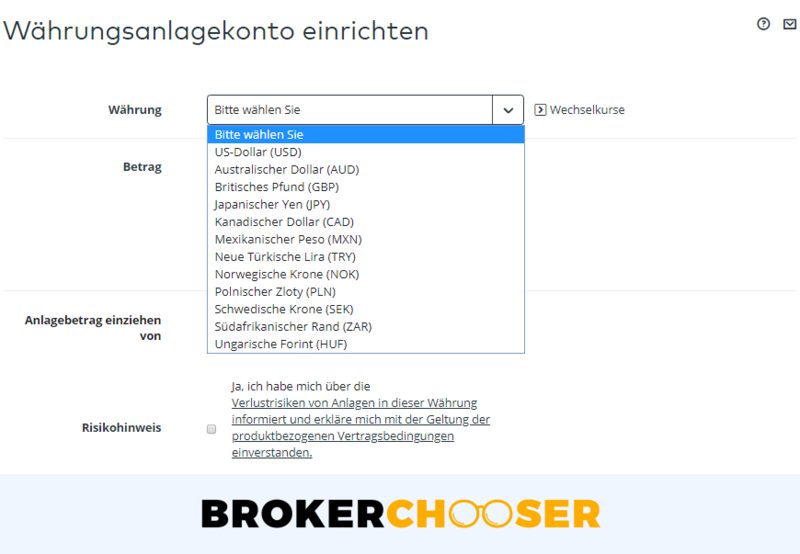 You can open your account conveniently via a live video identification or via an online form if you are from Germany or Austria. So account opening is fully digital for you. Account opening for other citizens are very complicated. You will have to go through a notarial identification process at your home country and send your application via the post. The deposit and withdrawal is free of charge, but you can it do it only via a bank transfer. You can have 13 base currencies for your Auslandsorder account: EUR, USD, GBP, AUD, JPY, CAD, MXN, NOK, PLN, SEK, ZAR, TRY, HUF. The rest of the accounts are euro based. Why does this matter? A currency conversion fee will be charged if you deposit in a different currency than the base currency of the target trading account. It’s likely not a big deal but something you should be aware of. Comdirect deposit fees are free of charge. You can deposit only via a bank transfer. Comdirect withdrawal fees are free of charge. This is a very similar fee compared to its peers. Comdirect's web trading platform is easy-to-use and it well customizable. You can also use several order types. The platform can be slow and the price alert function is missing. Comdirect's web trading platform, ProTrader is a good and intuitive trading platform. Its customizability is really great, you can set up as many layouts as you wish. However, its speed could be better, sometimes it is rather slow. Comdirect's search function is good, but you have to know what you are looking for. For example, for the "Apple" search word you get quite a long list of products, so you should know that you look for the Apple stock at the NASDAQ stock exchange. 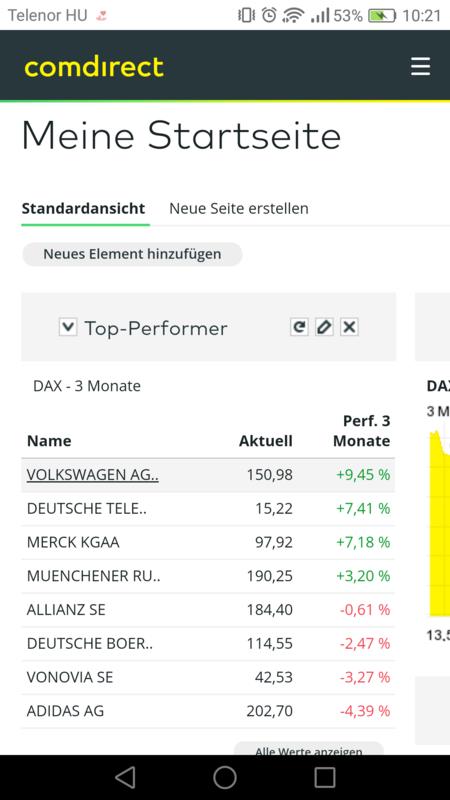 We liked that you can filter the results along asset categories and markets. For example you can search only for stocks on the London Stock Exchange. We really like that you can choose the exchange where you would like to execute your order. The only other broker which provides this is Interactive Broker that has the most advanced trading platform. However, we missed the stop limit order. The available order terms are today and the last trading day of the month. You can receive email notification about your executed trades, but price alerts are missing. The portfolio and fee reports are transparent. Comdirect's mobile trading platform is good for execution, but is not user-friendly. Comdirect has two mobile trading apps. The Comdirect mobile app and the Comdirect trading app. We evaluated the first since it is more advanced. Both apps are available only in German. Comdirect's mobile trading platform is far from being the best. It is ok for trading execution, but nothing more. It looks like a web platform packaged into an app. You can use both one and two step login. The search function is easy to use and usually finds the product you are looking for. The only trick is that it always returns the products listed in the German exchanges and the primary exchange of the product. For example, you search for Vodafone and app returns the Vodafone stock listed on the German stock exchange instead of the London Stock Exchange. Therefore, you should change the exchange after the search if you wish to trade on the primary exchange. The order placement is very similar to the web trading platform. Same as the web trading platform. Comdirect has a good market and product coverage. You can trade with all asset classes. In most of the asset classes, its closest competitors, DEGIRO and Saxo Bank has wider market coverage. The one exception is the investment fund, where Comsdirect is one of the bests in the marker. Comdirect also offers a social trading service though Wikifolio and a robo-advisory service as well. At Comdirect, you cannot reach penny stock trading. Most of the research functions are available from Comdirect's website and not from the trading platform. Trading signals based on technical analysis are also provided. You will find quite substantial amount of fundamental data on Comdirect's website. The most is provided for stocks. Here you will find historical income statement and balance sheet data for five years, but also estimations for the next three years. You will enjoy Comdirect's high quality charting tool. The functionality of the chart is great and you can use more than 30 technical indicators. The design is not the most up-to-date, is rather basic and clean, but we liked it. And the best thing: you can create and save as many charts as you wish. This is a function only a few trading platform can provide. This will definitely ease your work if you would like to do some technical analysis. A good quality news feed exists on the website, but the trading platform's news feed is not the best and the search function was not working for us. It is not possible to sign up for any newsletters, but an economic and stock exchange calendar is at place. If you are fond of research tools, Comdirect will not disappoint you. You can use Wikifolio as a social trading tool integrated into Comdirect. Comdirect is very strong in screening tools as well. A screening tool is basically a very advanced searching tool, where you save tons of filters to find the best products for yourself. Comdirect has screening tools for almost all the asset classes. This is a unique function, no other broker provides it. Beyond these, several other tools, like the risk-return or the scenario analysis tool will help you in your trading journey. Comdirect provides a very helpful and reliable customer service. You can reach out to them in several channels. On the flip side, communication is only in German. The language of the customer support is only German. The quality of the live chat and email was good. The answers were fast and relevant. However, the phone support was not the best. The customer support did not answer our call for several minutes. 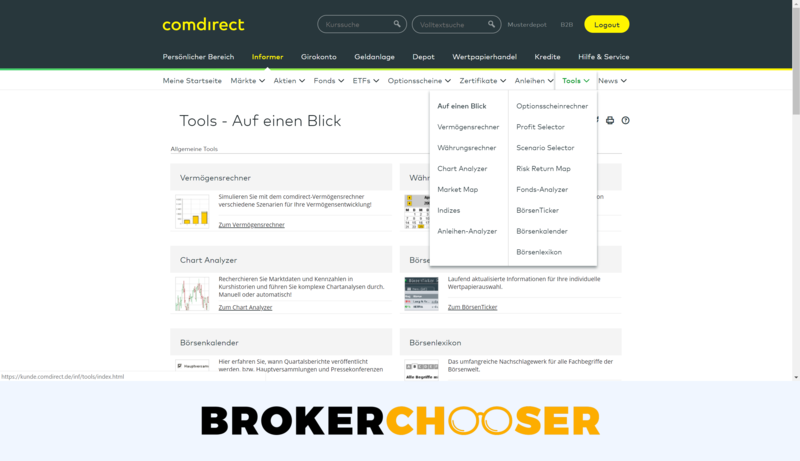 If you want to improve your personal investment knowledge, Comdirect has a lot to offer, but only in German. At Comdirect you will find trading platform tutorial videos, general educational videos and education texts. You can also set up a demo account. Comdirect has a banking background and it is regulated by BaFin, the German financial regulator. It is listed on the Xetra and London Stock Exchange. Furthermore, you have €20,000 account protection for securities and €20,000 for cash. Comdirect is a German broker established in 1994 serving mainly German, Austrian and Swiss clients. Is Comdirect safe? To be certain, it is best to check two things: how you are protected if something goes south and what the background of the broker is. Negative blance protection is provided for CFDs. 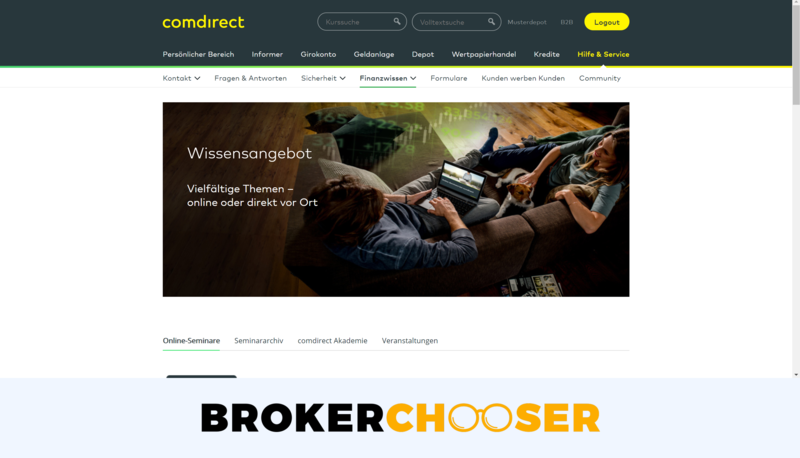 Comdirect is a German online broker established in 1994. It has 24 years track record. The longer the track record, the better. Longer track record means the company was able to manage financially tough time periods, like the financial crisis. Its parent company is Commerzbank, which holds a 82% stake in it. This is a good sign since a strong parent company provides further financial stability for an online broker. Comdirect also has banking license and is listed on a stock exchange. Both guarantees higher transparency and more regulatory scrutiny. Most of the products you can trade with Comdirect are exchange-traded, like stocks and ETFs . This is good news. If Comdirect defaults your assets still will be safe. However, there are a couple of exceptions, like CFDs or certificates. You will face a counterparty risk while trading these products. The counterparty of these products is usually Comdirect. If Comdirect defaults and cannot pay you, you still will be covered by the investor protection up to €100,000 for cash and €20,000 for securities. Having a banking background and a bank parent company, being listed on the stock exchange and regulated by BAFIN are all great signs for Comdirect's safety. 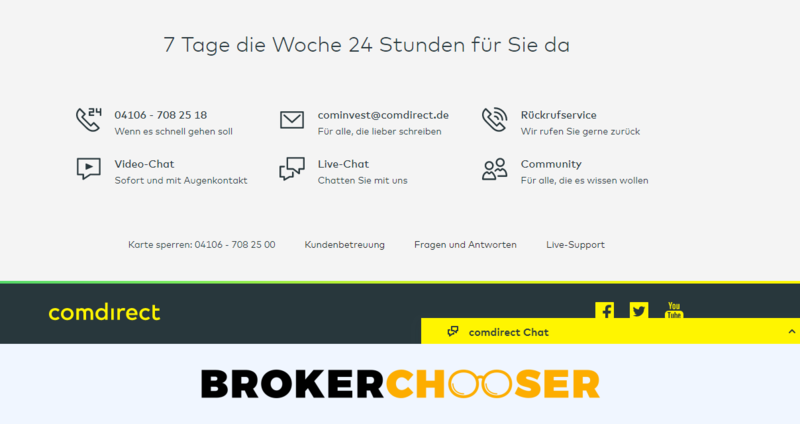 Comdirect is a German online broker established in 1994. Its parent company is Commerzbank, one of the biggest banks in Germany. 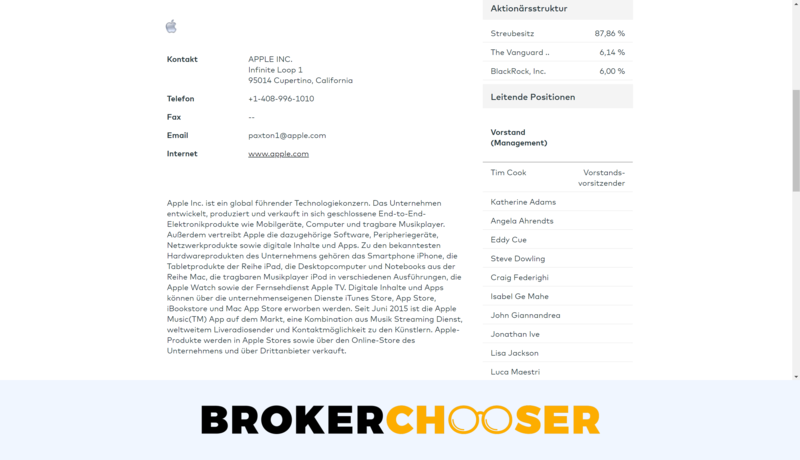 It is a good broker if you speak German. It has great research functions, a good trading platform. Its financial stability and transparency is high thanks to its parent company and its stock exchange listing. On the other hand, the full service is German and fees are high. Account opening is possible for non-Germans/non-Austrians, but it is very complicated. There is a Demo account, so feel free to try it out.